Detailing the physical features, habits, territorial reach and other identifying qualities of the Brown Panopoda Moth. A quirky birthmark changes the Brown Panopoda Moth from common and drab to engaging and fabulous. 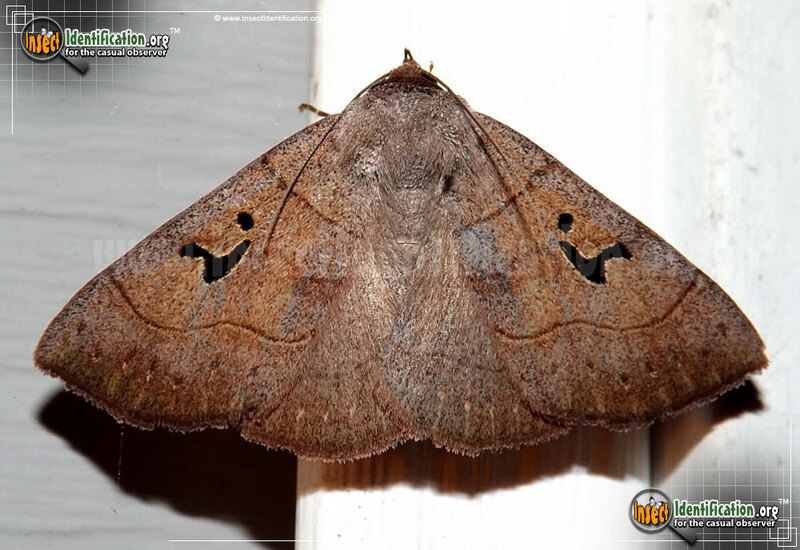 The Brown Panopoda Moth is a medium brown with a unique marking on each forewing. The marking is comprised of a single black dot and a capital 'L' with a curvy bottom. Together, these markings could make up a symbol for a person typing on a laptop; the kind one would find on wi-fi signage at airports, libraries, and cafes. The 'L' part of the mark may be small, faded, or even absent from individuals. When wings are open and spread out, two long, thin, wavy lines flow through the center and lower part of all four wings. A short thin line near the 'shoulders' does not cross the body. Caterpillars are a bright, leafy green, and covered in tiny dots from head to rear. 'Feet' are orange. They feed on the leaves hickory trees and are believed to also eat from basswood, oak, and willow trees. Adults are in flight throughout the summer; longer in southern parts of their range. They are nocturnal and are attracted to lights at night. Look for them in parks, woodlands, and neighborhoods where host trees are growing.